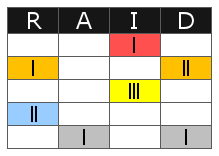 RAID Log is a project management tool that is used to store several project information in one place. It allows project managers to track risks, assumptions, issues and dependencies, making it a useful document in regular project meetings and when conducting audits. This template allows to keep track of everything happening in your project. You may use it to record relevant project information, and to regularly review and update these information at any time. It also comes with a dashboard that displays these information at a glance. This template is a Microsoft Excel spreadsheet that you can use and modify to suit your specific needs. It can easily be modified to include additional sections as required. You may, for example, add more columns to the log to include additional information such as the causes of risks and the controls that are in place. This template should be seen as a live document, not something that you do once then store away. It should be continually updated as more information is gained. Please help us to make this template better by providing us with your comments and suggestions.